Georgine Saves » Blog Archive » Good Deal: Pre-Seasoned Cast Iron Cookware 25% Off TODAY ONLY! Ships FREE! Good Deal: Pre-Seasoned Cast Iron Cookware 25% Off TODAY ONLY! Ships FREE! 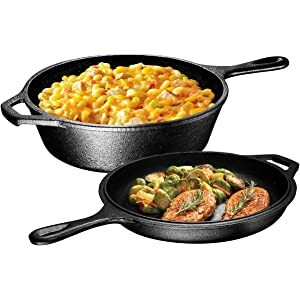 #ad Today only, 11-08-18, get ready for holiday cooking by saving 25% on pre-seasoned cast iron cookware at Amazon.com. This cookware has a pre-seasoned surface that is 100% non-stick and contains no chemicals, thus protecting your food and boosting your energy levels by emitting small amounts of much needed, nutritious minerals. Shipping is FREE.